At the age of 26, when most players are still absorbing the music’s vast lexicon and beginning the lengthy process of finding their own identity, Jason Marsalis is well on his way to becoming an exceptional jazz drummer. Recordings made over the past several years reveal a staggering array of technical skills and resources that are invariably applied to purely musical ends. From the press rolls of Baby Dodds, to Max Roach’s four-limbed independence, to the metric modulations of Jeff ‘Tain’ Watts, Marsalis has mastered the rhythms of the jazz tradition. He handles the slowest and swiftest of tempos (and everything in between) with ease, plays out-of-tempo interludes gracefully, and integrates funk, Latin, and Afro-Cuban beats into his overall palette. Marsalis’ rhythmic variety is matched by the diverse timbres he coaxes from a drum set. Utilizing combinations of sticks, brushes, and mallets (and sometimes even his bare hands), he strikes rims, the shells of his drums, as well as drumheads and cymbals. Spare and to the point, Marsalis’ playing on the head of Tony Vacca’s ‘Shoe Suede Blues’ (Tony Vacca, Three Point Landing’s Chicago, New Orleans, Phoenix, Half Note Records) is a very effective piece of small band drumming. Entering five measures into bassist Roland Guerin’s introduction, he starts off by keeping time on partially closed hi-hat cymbals and making the occasional, crisp-sounding stroke to the snare. These high pitched sounds make a fine contrast to the bass, and create a kind of swaying motion in relation to the direct movement of Guerin’s walking line. A stick shot announces the arrival of the rest of the band (Vacca’s alto saxophone, the trumpet of Irvin Mayfield, and Peter Martin’s piano), and for the next 12 bars Marsalis augments the hi-hat with snare drum accents (including a nifty three-stroke fill that’s a bit louder than everything else), and hits to the bass drum that are more felt then heard. These additional elements complement the melody and create a slightly agitated sense of movement. The payoff comes when he switches from the hit-hat to the ride cymbal just as the band begins to repeat the melody. Without increasing volume or introducing other new patterns, Marsalis’ straight quarter notes immediately make the music tighter and more focused. ‘Death March Of Our Time’ (Jason Marsalis, The Year Of The Drummer, Basin Street Records) showcases the drummer’s ability to hold a band together and make interesting contributions of his own at a deliberate tempo. During four solos he varies rhythms, textures, and dynamics. In unison with the bass and piano behind trumpeter Antonio Gambrell’s somber turn, Marsalis plays the snare (with snares off) and the bass drum at a low volume on beats one through three, then stays silent on the fourth beat. After an extended closed roll brings the band out of the doldrums, he uses the whole drum set in support of Derek Douget’s keening alto saxophone. Even though Marsalis keeps straight time with a minimum of embellishment, the listener is drawn to the sound of each drum and cymbal. Once again bringing down the dynamic level, his ride cymbal clears a path for Jonathan Lefcoski’s piano. Then returning to the same rhythmic motif as the first solo chorus, in support of bassist Jason Stewart, Marsalis plays a light stick shot and the bass drum simultaneously, but instead of leaving the last beat blank like before, he employs the foot pedal to make a slight, nearly inaudible clicking sound with the hi-hat. The unconventional fours that Marsalis trades with the band on the same track are as satisfying as any extended drum solo. He confounds the expectation that drummers must use their limited time in the spotlight to show off sticking technique and crowd-pleasing licks. With one exception (a busy, seemingly free form melange of patterns) he executes relatively uncomplicated rhythms that allow each stroke to hang in the air so the overtones can be heard clearly and distinctly. Employing silence as much as the components of his drum set, Marsalis’ bare bones figures meander across bar lines; it’s easy to get lost in them (again, the tempo is very slow) and surprised when the band returns. 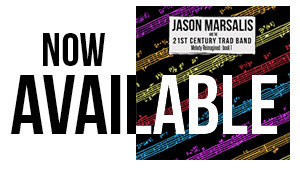 The introduction to his composition ‘There’s A Thing Called Rhythm’ (Jason Marsalis, Music In Motion, Basin Street Records) is an excellent example of Marsalis’ ability to direct the music from his drum kit in resourceful ways. His sticking on the hi-hat and ride cymbal serves as connective tissue between a series of jolting, three-chord (and one five-chord) figures played by the piano (Jonathan Lefcoski), bass (Peter Harris), and supported by the drums. Each of Marsalis’ brief, out-of-tempo interludes feature variations of single stroke rolls to a closed hi-hat that vary in texture as he goes along by means of a slight raising of the foot pedal. He concludes these phases with two or three hissing hits to the partially opened hi-hat, immediately followed by three taps to the bell of the ride cymbal which cue and establish the tempo by which the piano and bass enter. Moreover, each time Marsalis uses this maneuver he intentionally alters the tempo. Some of Marsalis’ most assertive playing occurs in the freewheeling, piano-less format of the track ‘Who?’ (John Ellis, Roots, Branches & Leaves, Fresh Sound New Talent). During the first chorus of tenor saxophonist John Ellis’ solo, he juxtaposes various components of the drum set against the relatively steady pulse of the ride cymbal. After an initial, somewhat uneventful four measures, Marsalis opens up and keeps coming at Ellis with a dense and intensely swinging barrage of asymmetrical beats. Single hits to the bass drum are deftly placed under snapping, irregular snare drum accents; light cymbal crashes, rim shots, single strokes to tom toms, and the occasional thwack to a partially opened hi-hat rapidly go by; and a couple of quicksilver, three-note fills on the snare stand out when he inserts them in brief gaps left by Ellis. The multiplicity of rhythms plus subtle changes in dynamics and sticking create a climate of boundless motion; yet despite Marsalis’ liveliness he stays in synch with bassist Roland Guerin’s walking foundation, and constantly responds to changes in Ellis’ narrative. Marsalis’ extended solo at the conclusion of ‘I-Witness’ (Roland Guerin, You Don’t Have To See It To Believe It, Half Note Records) is framed by a repetitive, four-bar riff played in unison by the rest of the band. The antithesis of a bunch of static, well-practiced licks, he fashions a brilliant improvisation out of wildly fluctuating rhythms that rub up against the fixed pattern from different angles. For a minute and forty-five seconds, the ever-inventive Marsalis never repeats himself. Although it’s impossible to divide the performance into discrete segments, some of the highlights include a stomping bass drum that plows across the beat, to which he adds another, semi-independent layer to the tom toms; figures to the snare drum and tom toms which arrogantly dance around the riff as if to imply that it’s ponderous or slow-footed; and, cued by some funky, deviant chords by pianist Peter Martin, Marsalis’ 4 and 5 stroke lines fit the riff perfectly and swing in a traditional manner. This entry was posted in Press, Reviews and tagged afro-cuban, afro-cuban music, all about jazz, alto saxophone, Antonio Gambrell', Baby Dodds, Basin Street Records, bass, bass drum, Branches & Leaves, brushes, cymbals, david a. orthmann, david orthmann, Death March Of Our Time, Derek Douget, drum set, drumheads, dynamics, extended drum solo, five-chord, four solos, four-bar riff, Fresh Sound New Talent, funk music, Half Note Records, hi-hat cymbals, I-Witness, Irvin Mayfield, Jason Marsalis, Jason Stewart, jazz drummer, Jeff 'Tain' Watts, Jeff Watts, John Ellis, Jonathan Lefcoski, latin music, light stick shot, low volume, mallets, Max Roach, melange, Music in Motion, New Orleans, out-of-tempo, Peter Martin, Phoenix, piano, Press, rhythms, ride cymbal, Roland Guerin, Roots, Shoe Suede Blues, small band, snare, snare drum, sticks, straight quarter notes, technical skills, tempos, tenor saxophonist, textures, The Year Of The Drummer, There's A Thing Called Rhythm, Three Point Landing's Chicago, three-chord, three-stroke fill, timbres, tom toms, Tony Vacca, trumpet, trumpeter, unconventional fours, You Don't Have To See It To Believe It on April 4, 2003 by abell.